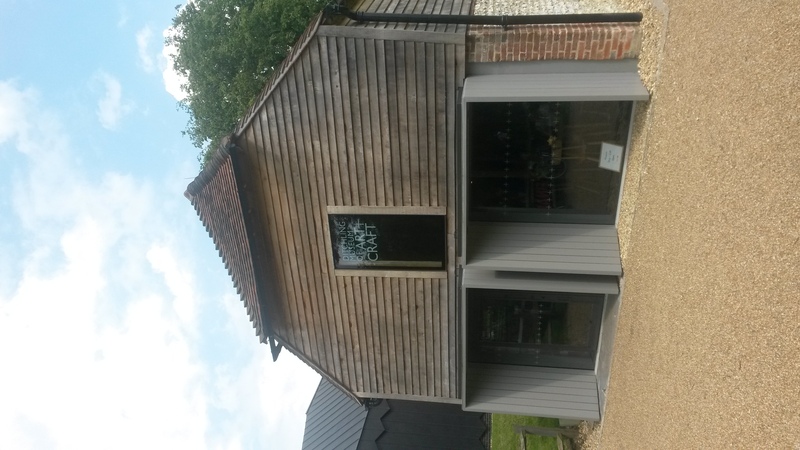 There is a certain honesty in the refurbished Ditchling Museum, which reopened at the end of last year as the Ditchling Museum of Art + Craft, that would have appealed to the artists and craftsmen which it celebrates. 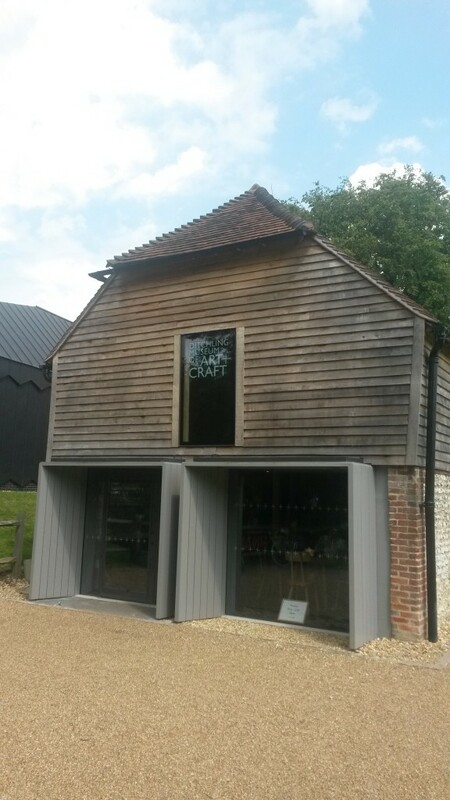 Ditchling Museum was founded in 1985 by two elderly sisters – Joanna and Hilary Bourne – who snapped up a disused school beside the village green and pond. The sisters had known personally the many stars of the Arts & Crafts Movement who had settled in Ditchling under the stewardship of Eric Gill, the famous sculptor. I decided to travel to Hassocks by train so that I could enjoy the pleasant walk through nearby Keymer which added to the whole experience. A tiled barn-like structure came into view first which serves as the museum’s entrance and cafe. It was once a cart shed and was in a ramshackle condition prior to the works. Friends recall it alongside portacabins prior to the refurbishment. After being stripped back and tidied up, it gleams. Next, a subtle tiled link building, with a gorgeous modern window at its rear, takes visitors up 11 concrete steps into the main museum – into a brand new zinc-clad structure, of a similar height to the cart shed. 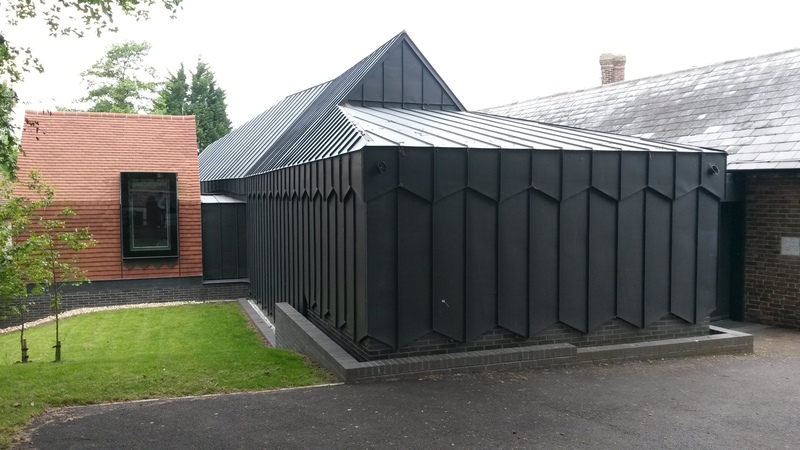 The black zinc stands out for the way that it fits in – and its 15ft-high west-facing window is incredible. It is instantly apparent, inside and out, that something magical has been carried out by Adam Richards Architects, the firm that was responsible for this project. Eric Gill, whose work includes distinctive sculptures on 55 Broadway (the headquarters of Transport for London) and the BBC’s Broadcasting House, moved to Ditchling in 1907 and formed the Guild of St Joseph & St Dominic with a band of fellow religiously-minded artists. If ‘Guild’ wasn’t a play on his name then it should have been. Other members included Hilary Pepler and Dunstan Pruden whose work is displayed throughout the museum. Not a member, but connected, was the calligrapher Edward Johnston, who designed the typeface and symbol of the London Underground. Honesty in architecture was key to the Arts & Crafts Movement. The principle goes hand in hand with being proud of materials that are used. It means picking ingredients that don’t have to be hidden away. In modern times, perhaps this translates to exposed zinc, lime-washed glulam beams and polished concrete floors. I hope so.